Flooring is an important element in kitchen design and it may be a challenge to select the most suitable flooring which is long lasting, durable and also within the budget that you have set for your kitchen project. 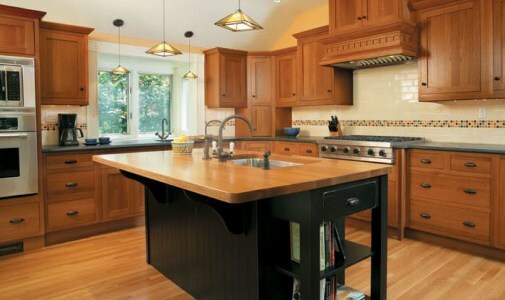 How about installing laminate flooring for kitchen in Vancouver? We will explore the factors for consideration and answer some questions that you may have about of using laminate flooring for your kitchen. Though laminate flooring doesn’t gain character over time and cannot be sanded, it is extremely durable and comes with a lower price tag compared to the average hardwood flooring. Kitchen flooring may encounter frequent water and cooking spills which means you may have to mop or give the floor a good wash regularly as part of your house cleaning routine. Therefore, it is essential to install flooring which is durable and able to withstand ordinary uses and the kitchen disaster that happened once in a blue moon such as water leakage from the dishwasher and not discovering the mess for a few days. Laminate flooring is an ideal choice for your durable kitchen surface as it is able to withstand cooking spills, heavy traffic and scratch-resistant. Why does laminate flooring holds up well against water? Laminate flooring that has been properly installed has seams on the top layer which are so tight that they are practically non-existent. The perimeter is covered with baseboards or quarter-round. Theoretically, water won’t even reach the core. Though the laminate is like a pressed wooden board, the core of the laminate wood plank acts very good against water as the lignocellulosic fibers such as dried wood pulp are combined with a synthetic resin as the bonding agent which help promote dimensional stability. Hence the synthetic resin helps the laminate core to maintain its shape to some degree when it get in touch with water. Why is laminate flooring extremely durable and scratch-resistant? Laminate flooring is a sandwich composed of the core substrate, the image layer, and the wear layer. The transparent top layer function as a layer that protect it against abuse such as scratches. It works better in this aspect than hardwood flooring. Environmentally friendly. Laminate flooring sold at our store have been given the E1 environmental rating (the lowest amount of emission). Wearability of flooring is measured by the Association of European producers of Laminate Flooring’s (EPLF) AC rating system. AC Ratings are divided into two main sections, residential laminate flooring (AC 1-3) and commercial laminate flooring (AC 4-6). The number indicates the amount of traffic the flooring can be expected to handle without being overstressed. They are categorized by locations with moderate, general/normal, or heavy traffic conditions. Check out our selection of laminate flooring or feel free to email us at bclaminate@gmail.com if you have any question. Our friendly and experienced team are around to assist you to create your perfect dream home in Vancouver.